Many people know what it feels like to miss a paycheck. That empathy has led to coast-to-coast casseroles, gift cards, and food drives as Americans take care of neighbors who work for the federal government. JANUARY 23, 2019 - TYBEE ISLAND, GA., AND BOSTON - The Tybee Marine Rescue Squadron is a citizens’ response unit that uses private boats to mostly help wayward “klackers” – a local nickname for novice kayakers who get lost in the Southern salt marshes. 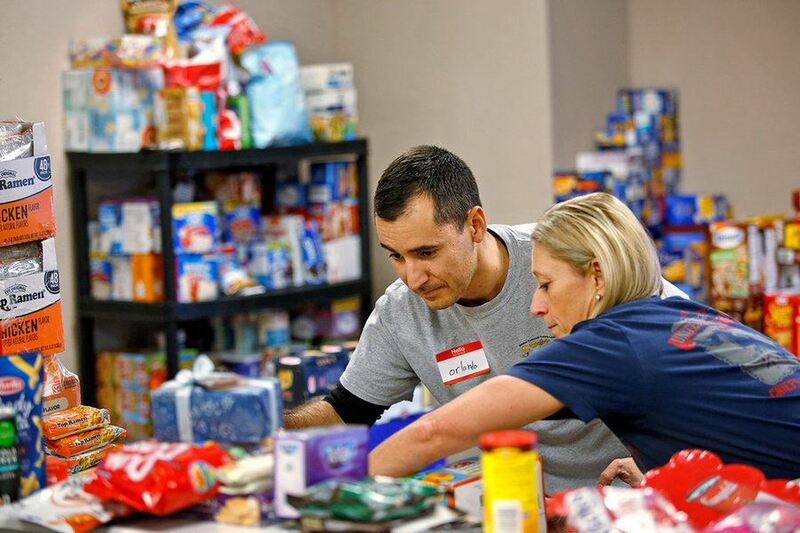 Orlando Posada and Rachael Michaels sort through food donations. They were among hundreds of volunteers and recipients Jan. 19, 2019, at Help for Hampton Roads Coast Guard Families food drive, sponsoered by the Chief Petty Officer Associateion, in Chesapeake for families affected by the shutdown.Stephen M. Katz/ The Virginian-Pilot/APBut the volunteers also search for drowning victims and shipwrecked sailors. And on those bigger jobs, inevitably over their shoulders is the Coast Guard chopper – “the Coasties” – bearing down to help the civilians “any time, anywhere, in any weather,” as MRS member Barry Brown says. More than a month into the longest government shutdown in United States history – and days away from when some 500 Coasties on the Georgia coast are about to miss a second paycheck – the symbiosis between islanders and federal eyes-in-the-sky has taken on a new meaning. Last Wednesday, Mr. Brown and others at the MRS squad led a fundraising effort that encouraged the island’s roughly 3,000 residents to give $20 gift cards to help Coast Guard members bridge the lapse in income. A few days later, town clerk Jan LeViner had collected $24,000. A dealership pitched in another $5,000. Cards poured in from Oklahoma and other places. On Saturday, a benefit barbecue at Hunter Air Field in nearby Savannah, Ga., raised another $8,000. The Coast Guard is unique – the only armed service branch not being paid, even as the blue-coated crews patrol the nation’s seaward boundaries, intercepting, as they did Tuesday, a boat of migrants trying to enter the US illegally. But the gift cards, free meals, and waived co-pays is much broader – a wave of compassion that is pushing against the walls of Congress and the White House this week as the nation’s elected leaders struggle to resolve a budget-shutdown-turned-moral-showdown. It is the 10th federal shutdown since 1980. But no others have sparked this kind of response. To be sure, some furloughed families report being berated by Facebook friends for not being financially prepared, reflecting, perhaps, a pervasive impatience with government-writ-large. But for the most part, the response has been based on a recognition that furloughed workers are neighbors who build their professional lives around public service. In Tampa, Fla., the airport now has a pop-up food bank. KISS band members Gene Simmons and Paul Stanley are offering a free meal per day at their Rock & Brews chain of airport eateries. Bahamas Paradise cruise line opened two boats offering a free lunch buffet to federal workers. Slick Energy is offering to defer payments on 100 gallons of heating oil for furloughed workers until 21 days after the shutdown ends. In Boston, the five Friendly Toast restaurant franchises all are offering free grub to government workers – one of many restaurants across the country offering free meals. 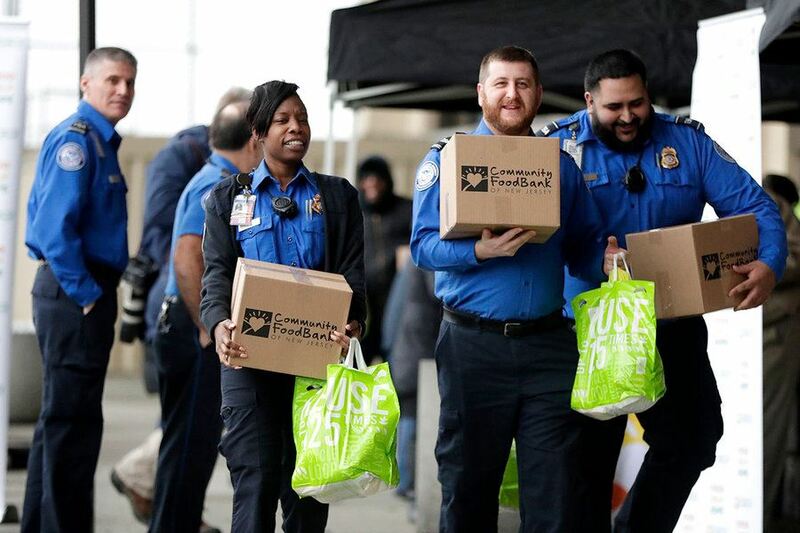 And even though the TSA line can be a point of tension for those of Middle Eastern descent, the Grand Strand Muslim community in South Carolina has provided food and other items for TSA workers. Corporations, including banks, are stepping in. Hackensack Meridian Health in New Jersey is waiving co-pays and deductibles for emergency care. In Chicago, LaSalle Network, a staffing and recruiting firm, is hiring at least one furloughed employee per day for $15-an-hour wages. To be sure, some congresspeople have given up their pay and President Trump has called the furloughed workers “great American workers” for their sacrifice. But as the Senate takes up competing bills Thursday that would reopen the government, glimmers of compromise reflect a building impatience in the nation. For Tom Edwards, a research scientist for the US Geological Survey based in Utah, furloughs are nothing new. This latest one is his sixth, as he has worked for the federal government in some capacity for 32 years. “I’ve got a son deployed in the Middle East right now [and] I put my mom in hospice last week,” says Mr. Edwards. “This is kind of the straw that broke the camel’s back and I don’t need a stupid furlough on top of that. But if you think of all the additional straws on those families’ back – if it’s affecting me, when I don’t have many financial stressors, it must be horrible for those families” that have it worse. And though Edwards is thankful for the support, he says the largess can’t cover the extent of the actual need. “We’re a really strong nation of people who pull together in national crises and look out for their neighbors and look out for their friends, but it doesn’t necessarily put cash on the table,” he says. In Vermont, Republican Gov. Phil Scott signed legislation from the Democrat-controlled legislature to join California in extending unemployment benefits to people currently working without pay. The state has some 1,500 furloughed workers; so far, about 100 have signed up for benefits. That tentative participation reflects what Elizabeth Arias of Joliet, Ill., says she is feeling. Her husband, a federal law enforcement officer in the Department of Homeland Security, is facing what she considers “indentured servitude” as he works 11-hour days without pay. She is tracking updates on social media via #ShutdownStories, and has heard about a local cafe offering free lunch and a trampoline facility offering an hour of free gym time to blow off some steam. So far, she has not taken any offers besides a gift card from a local businessperson. But that may soon change, she says, if the shutdown stretches on. Staffer Clarence Leong contributed reporting from Boston.